This recently converted beautiful 2br with private terrace is simply fantastic. The apartment features hard wood floors and a fully equipped kitchen. Both bedrooms have queen sized beds and dressers. The living room has a pull out sofa, chairs and a large flat screen with cable TV and X box (with games). The small terrace is perfect for getting a breath of fresh air. As for the building... it is a newish (2007) elevator building located on a quiet street and is close to everything! (you can hang out in the lower east side (0-5 min walk)... you can shop in soho. (5-8 min walk).. you can have dinner in little italy (5 min walk)... you can have brunch in the east village (5-10 min walk)... you can have authentic chinese food in china town (5 min walk)...plus there are several subways within a 3-5 min walk so it's easy to get around the city (F/M/B/D/J/Z/6 lines)... The bottom line is this apartment is far better than a tiny hotel room for less money. Come stay here...I promise, you'll be happy you did!!! A small 2 bedroom apartment that was just fine for 2 couples. A great location: easy walks to great restaurants, interesting sites and museums. The location is fantastic. A couple of blocks away from the subway station. Coffee, fast food, pizza and other sit-down restaurants a short walk away as well as some fun bars. We easily walked to Chinatown and Little Italy. The apartment has 2 nicely sized rooms and 1 bathroom. The living area is small but comfortable. I would suggest adding mirrors in the bedrooms to allow for multiple people getting ready at the same time and a mat in the tub to avoid slips/falls. I would definitely stay here again. 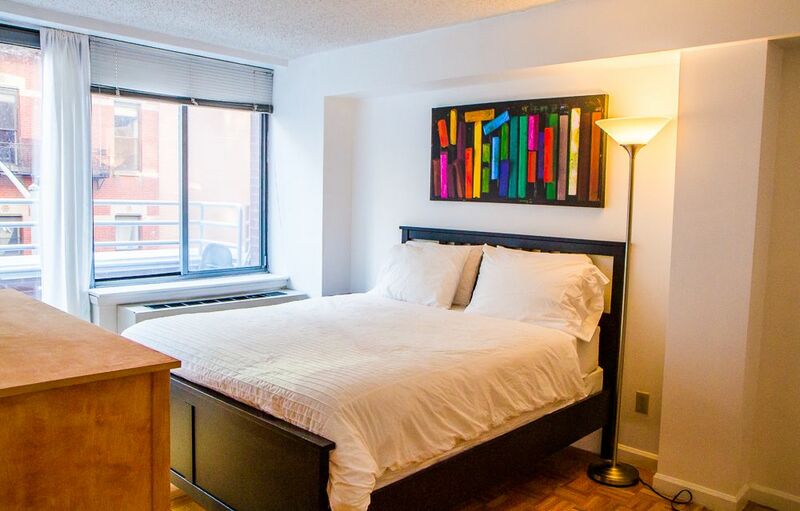 Great location in the Lower East side, close to good restaurants and minutes from Soho neighbourhood. Would hapily go back. Surprisingly spacious, extremely comfortable in great neighborhood! We loved this apartment! Plenty of room for our family of four in very safe, fun neighborhood. Kitchen was well-stocked and bedrooms were both sunny, facing the street. The only issue we faced was the lack of working towel racks, but we were having such a great time we didn't care! Mike responded very quickly to our questions and we would love to return! September 2018 - two couples and one 14month old stayed for 5 nights. The apartment had all the basics we needed (including a high-chair!) and was reasonably well maintained, although could do with a deep clean. The location is great - close to the subway, shops, restaurants, parks etc. - and worked well as a base for days out sight-seeing. Great location, specious, very comfortable apartment! Four of us stayed comfortably for a week. The apartment is specious and well equipped. It is located in a quiet street in a renovated building. We took advantage of the kitchen and made there many of our meals. We appreciated the elevator as some in our party had difficulty walking. It is located in proximity to many attractions, subway stations and restaurants. The owner was very responsive. We recommend it and will definitely stay there again.